Standing 115 metres high, the ArcelorMittal Orbit is the tallest art structure in Britain – offering stunning views over the Olympic Stadium, Olympic Park and the whole of London. Located in Orbit Circus in the south of the Olympic Park, the ArcelorMittal Orbit is London’s major new visitor destination – both during the Games and beyond. 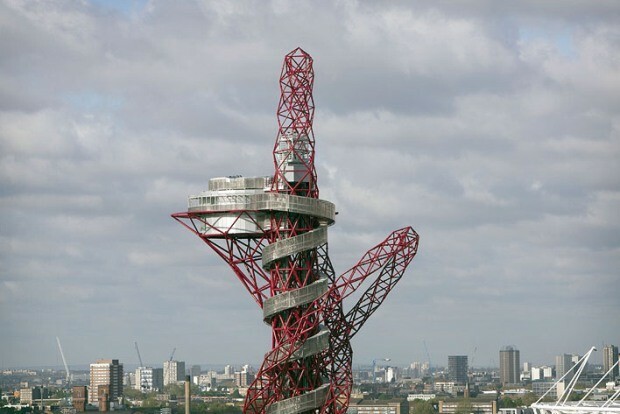 Following a lengthy selection process, the ArcelorMittal Orbit – designed by internationally acclaimed artist Anish Kapoor and Cecil Balmond- was chosen. As well as promising a unique moment and experience for visitors, the spiralling red structure successfully represented both London and the UK, and was reflective of the five Olympic rings. Mike Brace worked with VocalEyes Describer Willie Elliot on the description of the ArcelorMittal Orbit for London Beyond Sight (2012). The description of the ArcelorMittal Orbit was voiced by Ben Galpin. Exit Stratford tube station and continue forward and then turn left at the junction onto Westfield Stratford City and then left again onto Stratford Walk. Continue past the Aquatics Centre on the right and then turn right onto Orbital Circus, the ArcelorMittal Orbit is in front of you. The Olympic Park is fully accessible and the ArcelorMittal incorporates a lift to the upper viewing areas; tickets have to be pre-booked. Parking – There is public parking in the Westfield Centre.